No, seriously — New York Knicks guard J.R. Smith has been fined $50,000 for trying to untie his opponents' shoes after being told not to do so. New York Knicks guard J.R. Smith has been fined $50,000 for recurring instances of unsportsmanlike conduct, it was announced today by Rod Thorn, President, Basketball Operations. During the Knicks’ 92-80 win over the Dallas Mavericks on Jan. 5, at American Airlines Center, Smith untied the shoelace of Mavericks’ forward Shawn Marion during a free throw attempt. After Smith was warned by the league office to refrain from further conduct of this nature, he attempted to repeat the action last night during New York’s 89-85 win over the Detroit Pistons at Madison Square Garden. After the Knicks' Tuesday win, Smith told reporters, "I wasn’t really too concerned about [getting fined]" for doing it again. Naturally. Of course Smith wasn't concerned about being fined; why start being concerned now? He received a $25,000 fine back in November for "directing hostile and inappropriate language to another player via Twitter" following a brief spat with Pistons point guard Brandon Jennings, which was the second time he's been dinged 25 grand for a Twitter-related offense since joining the Knicks. He was also fined $5,000 for flopping during the 2013 playoffs and $25,000 for a flagrant foul while a member of the Denver Nuggets in 2011. Add in the game checks lost during his multiple suspensions — for violating the league's substance abuse policy, for elbowing Jason Terry, for pleading guilty to reckless driving in connection with a 2009 car accident that killed a passenger in his car and required Smith to serve 30 days in jail, for his part in a 2007 nightclub incident while with the Nuggets, and for his role in the 2006 fight between the Nuggets and Knicks at Madison Square Garden, and you're talking about a pretty staggering sum of surrendered income. And as ESPN.com's Brian Windhorst notes, that doesn't take into account any unannounced team fines or the reported $1 million fine he received while playing in China (although Smith did later sue his Chinese employer to recoup that money). Mike Woodson came out strongly against J.R. Smith's fine while on @ESPNNY98_7FM: "It's unacceptable. It really is. It's unprofessional." Woodson on JR: "There’s no question he's done a lot of things this year that has put him in a bad position and our team in a bad position." More Woodson on JR: "This is unacceptable. It's just got to stop. I keep saying this every time something pops up, but it's got to stop." 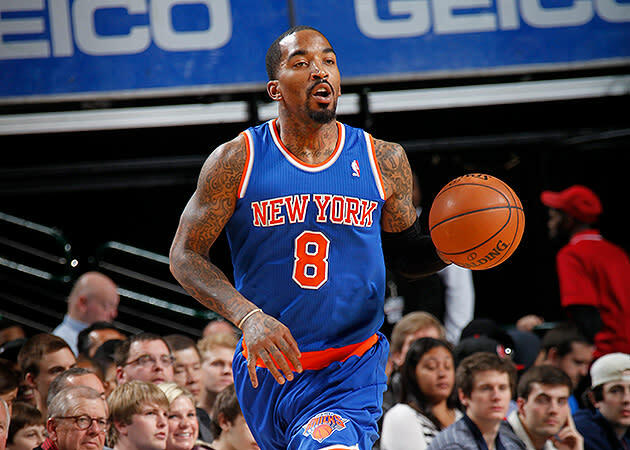 #Knicks coach Mike Woodson, speaking on @ESPNNY98_7FM, says of J.R. Smith: "At the end of the day, he's got to grow up." Smith, by the way, is 28 years old, and in the 10th year of an NBA career that has seen him play nearly 700 regular- and postseason games and 18,000 combined minutes. It'll be interesting to see if Woodson backs up his words by reducing Smith's playing time. J.R. is averaging 32.3 minutes per game, the second-highest mark of his career (topped only by his Sixth Man of the Year Award-winning 2012-13 campaign under Woodson), despite shooting a career-low 34.8 percent from the floor and a below-league-average 33.9 percent from 3-point range and posting a single-digit Player Efficiency Rating of 9.9 (league-average is 15). The Knicks have also performed significantly worse with Smith on the floor than off it thus far this season — New York's been outscored by 5.7 points per 100 possessions in his 938 minutes of floor time, and outscored by 0.8 points-per-100 in 709 minutes without Smith's services, according to NBA.com's stat tool. Strong recent play by fellow guards Iman Shumpert and Toure' Murry, the presence of rookie wing Tim Hardaway Jr., the return of injured point guard Raymond Felton and the impending return of reserve Pablo Prigioni would seem to give Woodson enough backcourt depth to be able to send a message by providing the negative reinforcement of a benching, or at least a curtailing of PT, when the Knicks take on the two-time-defending champion Miami Heat on Thursday. Given Woodson's stated preference for avoiding youngsters in high-leverage moments, his past unwillingness to stick with Prigioni despite his routinely positive play and his apparent aversion to holding the likes of Smith, Carmelo Anthony and Andrea Bargnani accountable for their mistakes while scapegoating the likes of Shumpert and Udrih, though, Knicks fans probably aren't holding their breath. Dan Devine is an editor for Ball Don't Lie on Yahoo Sports. Have a tip? Email him at devine@yahoo-inc.com or follow him on Twitter! Follow @YourManDevine Stay connected with Ball Don't Lie on Twitter @YahooBDL, "Like" BDL on Facebook and follow BDL's Tumblr for year-round NBA talk, jokes and more.